August 2012: I’ve always been fascinated by George Armstrong Custer and the battle at Little Bighorn. Perhaps it’s from watching too many westerns as a kid or because pop culture constantly references it – the 1941 Errol Flynn movie, for example, and the 1963 Twilight Zone television episode and the movies “Little Big Man” in 1970 and “The Horse Whisperer” in 1998 and countless others. The battle took place in June 1876, the same year Alexander Graham Bell invented the telephone* and the year of the American centennial. It was a cultural spike in American history that shocked the public. Linda and I have traveled fair distances on the motorcycle but never got to the northwest quadrant of the U.S. until recently. We rode through Theodore Roosevelt National Park in North Dakota in 2010 but didn’t have enough time to cross over into Montana. Montana didn’t happen until 2012, when we took the Going-to-the-Sun Road through Glacier National Park. That was a great ride in itself, making up for the many exhausting miles we covered in too few days. On the way home from Glacier, we were able to stop at Little Bighorn Battlefield National Monument. To get to Custer’s Last Stand, you drive across grass fields to a toll booth and a big parking lot with a restroom and a ranger station/visitors’ center. Beyond that is Last Stand Hill, with its white obelisk, bearing the names of fallen men of the 7th Calvary. Historians say 263 soldiers were killed and 55 wounded in the battle against several thousand Indian warriors. No one knows how many Indians died; estimates vary widely from 30 to 300. The remains of the soldiers themselves are in a common grave around the base of the obelisk. Tombstone-like markers have been placed where soldiers are believed to have fallen. A black iron fence surrounds them. The battlefield was designated a military cemetery in 1879 and became part of the national park system in 1940. 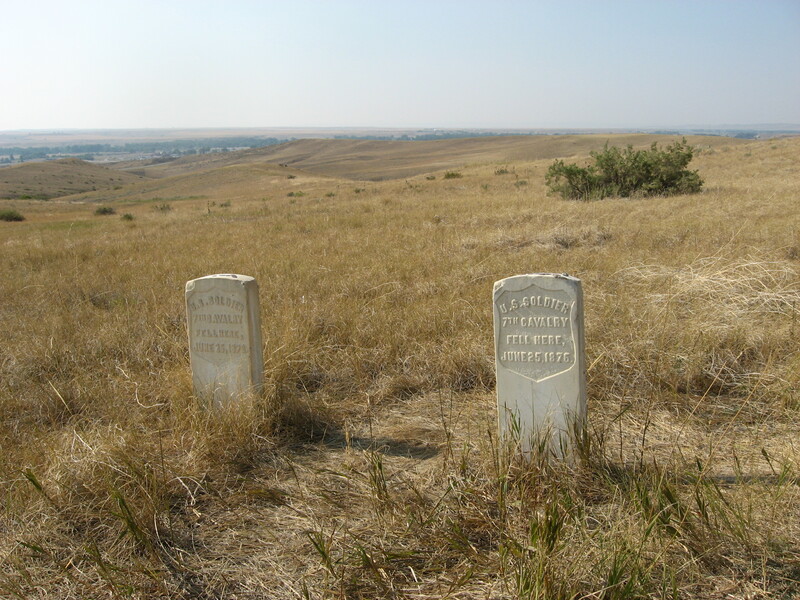 Its name was changed later to Custer Battlefield National Monument. 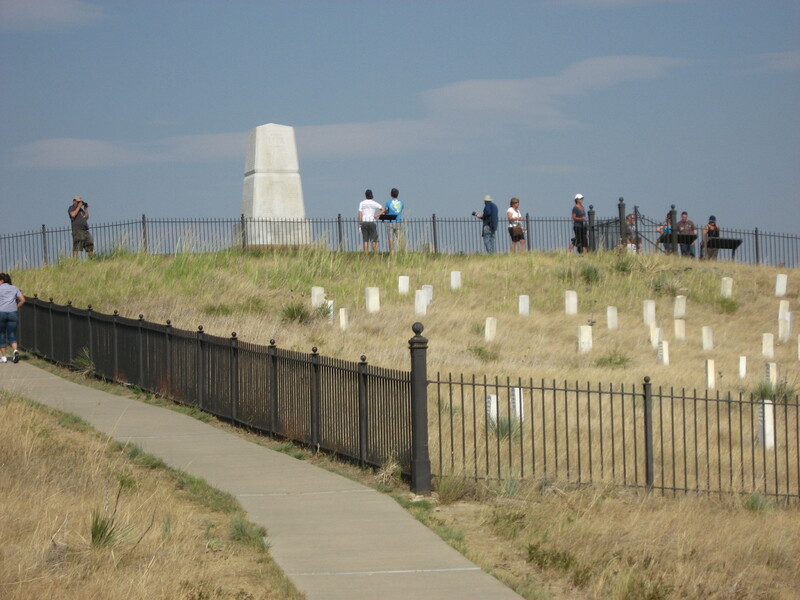 The park emphasized the losses of the U.S. Army until 1991 when Congress changed its name again to Little Bighorn Battlefield National Monument. It became a memorial to a clash of cultures in addition to the memories of the soldiers and the Sioux, Cheyenne and Arapaho warriors. 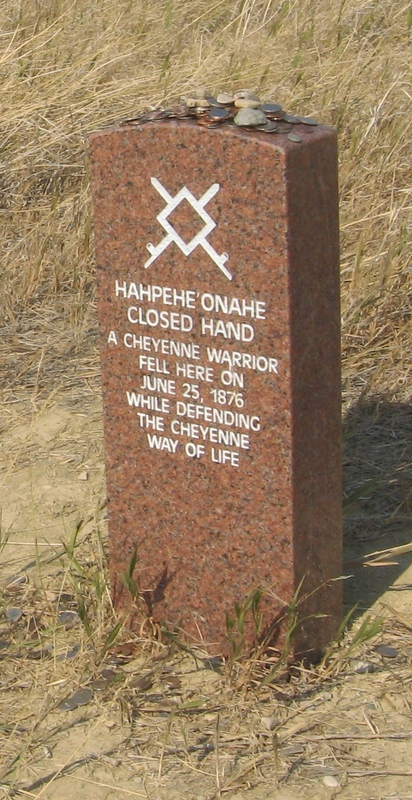 An Indian Memorial was built in 1996 and red granite markers showing where warriors fell were added starting in 1999. All of which was overdue, I think. But nothing really prepares you for the park itself. Already tired from the day’s ride, we park the bike, take off our helmets, and stumble wearily toward the center, moving awkwardly in boots and armored riding suits, like astronauts on a heavy-gravity planet. The white obelisk beckons from the top of the hill, so we bypass the center and walk toward it. Distance from the visitors’ center to Last Stand Hill is maybe the length of a football field but once there, everything is different. The top of the hill gives a view of rolling grasslands in every direction, falling away forever, land so empty and immense and eternal it seems to swallow up sound. The only thing you can hear is the wind ruffling the long dry grass. That’s when I realize how god-awful place this is, how damned lonely and remote and uncaring. A true cemetery. It didn’t take much to imagine being pinned down on this hill and hearing war cries and the shrieks of the wounded and dying. It was too damned real. It was in that moving grass like memory. We walk around and go in the visitors’ center and see the exhibits and watch some of the videos but nothing touches me like those moments on Last Stand Hill. We fire up the motorcycle and slam out of there, stopping to refuel at the Exxon pavilion in Crow Agency, on the Indian reservation just outside the park. We’re tired and hungry and decide to eat at the KFC outlet – a KFC, of all things, on a reservation. A Native American takes the order and he’s talkative enough to make me consider asking him if he’s been up on Last Stand Hill and what he’s felt there. In the end, I don’t, preferring not to look like a dopey white tourist. Besides, I’ve already felt something myself. * – Ignoring for now the patent controversy between Bell and Elisha Gray in February of that year.